Based on the novel by John le Carre`, A Most Wanted Man is the story of a German security agency leader who leads a team of German and U.S. security agents to track down a political refugee from Chechnya who has entered Hamburg. Directed by Anton Corbijn and screenplay by Andrew Bovell, the film is a suspense-thriller where a group of individuals track down a man who could be anything as they hope to protect the world. Starring Philip Seymour Hoffman, Rachel McAdams, Robin Wright, Daniel Bruhl, Nina Hoss, Grigoriy Dobrygin, and Willem Dafoe. A Most Wanted Man is a chilling yet evocative film from Anton Corbijn. The film revolves around a security agent leader who learns that a half-Chechen, half-Russian man, who is the son of a Russian mafia leader, has arrived to Hamburg seeking political asylum as well as revealing he is the heir to money his father has hidden wanting nothing to do with it. It plays into this increasing sense of paranoia that looms around the world as this German security official is forced to go rogue with his team as they want to know what this young man is doing in Hamburg as he’s aided by an immigration lawyer and a wealthy banker who has the money that belongs to the young man. Andrew Bovell’s screenplay is quite unconventional in terms of its lack of grand suspenseful moments in favor of investigation and see if the man they’re targeting is a threat. 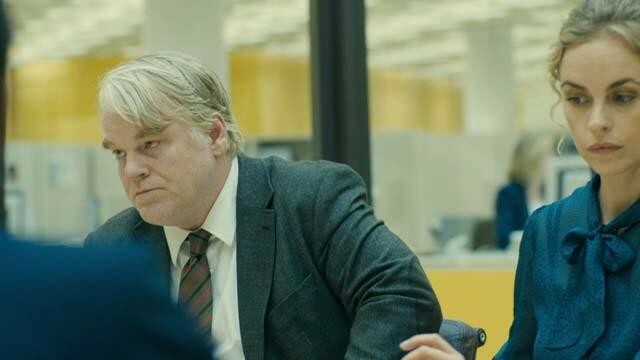 Leading the pack is Gunther Bachmann (Philip Seymour Hoffman) as he is a man that’s seen a lot including the events in Beirut in the early 1980s as he is been asked to track down a noted Muslim philanthropist who is believed to be funding a terrorist group. When Bachmann receives word that Issa Karpov (Grigoriy Dobrygin) is in Hamburg trying to seek asylum with the help of the immigration lawyer Annabel Richter (Rachel McAdams) who hears about Karpov’s situation as well as the banker Tommy Brue (Willem Dafoe) whose father laundered money for Karpov’s father many years ago. Much of the first act is about Bachmann doing his job as well as deal with others wanting Bachmann to go after anyone and deal with them personally as he befriends the American securities agent Martha Sullivan (Robin Wright). The second act is about Bachmann trying to find Karpov and what he’s really trying to do as they target Richter for information and wanting her help. Richter and Brue are reluctant to help at first but they would be the ones to get Karpov to get access to his money as well as go after the Muslim philanthropist Dr. Abdullah (Homayoun Ershadi) where Bachmann has secret meetings with Dr. Abdullah’s son Jamal (Mehdi Dehbi). All of which leading to Bachmann finding a way to help both Karpov and Dr. Abdullah in the chance he could do something right and regain some idea of hope. Anton Corbijn’s direction is quite straightforward though it has elements of style as it is shot largely on location in Hamburg, Germany with additional shots set in Berlin. While much of the compositions that Corbijn creates are straightforward in terms of the wide and medium shots. It’s his emphasis on the latter as well as close-ups that give the film an intimacy as well as the way Corbijn would shoot compositions or scenes of Bachmann doing surveillance with his team in a van. There are some hand-held shots in the film as well as a few stylized crane shots in parts of the film as Corbijn wanted to create something that feels real with the audience feeling like they’re a part of a team. The direction also maintain a low-key approach to the suspense where it would give the film a slow pace that is challenging due to the lack of action for much of the film. It all plays into Bachmann trying to do what he feels is right yet has to contend with the fact that there’s others involved who have their own interest and ideas of justice. Even if that idea doesn’t involve what is right for a safe and secure society. Overall, Corbijn crafts a thrilling yet engaging film about a German securities agent trying to help a Chechen man gain asylum. Cinematographer Benoit Delhomme does excellent work with the cinematography with its usage of low-key and colorful lights for many of the interior/exterior scenes set at night as well as a more natural look for the scenes set in the daytime. Editor Claire Simpson does fantastic work with the editing as it feature some jump-cuts to play into the suspense and drama while it is largely straightforward to play into its slow yet methodical pace. Production designer Sebastian T. Krawinkle, with set decorator Yesim Zolan and art director Sabine Engelberg, does nice work with the look of the places that Bachmann and his team work at including the interrogation base where they try to get answers from Richter as well as the home of Brue. Costume designer Nicole Fischnaller does terrific work with the costumes as it largely straightforward in terms of the look of the characters with many of the top security officials wearing business-like clothing. Visual effects supervisor Malte Sarnes does some good work with the visual effects as it’s mostly set-dressing for a few locations. Sound designer Frank Kruse is brilliant for the sound in capturing the world as well as how audio is recorded during some of the surveillance as it’s a highlight of the film. The film’s music by Herbert Gronemeyer is amazing for its low-key mixture of electronic music and soft orchestral strings to play into the drama and suspense while the soundtrack features music from Gang of Four, Phil Phillips, Claudia Brucken, Brainbox, Tom Waits, and Roy Orbison that is played on location including a jukebox. The casting by Simone Bar and Jina Jay is great as it feature some notable small roles from Derya Alabora and Tamer Yigit as a Muslim mother-and-son duo who take Karpov in, Kostja Ullmann and Franz Hartwig as a couple of Bachmann’s associates who help watch over Karpov and Richter, Vicky Krieps as a female agent who works for Bachmann, Rainer Bock as Bachmann’s superior who wants him to nab Dr. Abdullah, Mehdi Dehbi as Dr. Abdullah’s son Jamal, and Homayoun Ershadi as Dr. Abdullah as a Muslim philanthropist who is possibly connected in funding a terrorist organization as Bachmann wants to help him do good in the hopes he can be saved. Daniel Bruhl is superb as Bachmann’s jack-of-all-trades in Maximilian who helps watch over everything as well as do whatever he can to get things done. Nina Hoss is fantastic as Bachmann’s right-hand woman Irna Frey as a woman who approaches things much more differently than Bachmann as she would prove to be someone that even Richter can trust. Grigoriy Dobrygin is excellent as Issa Karpov as a political fugitive who has fled Chechnya as he seeks political asylum as well as not wanting anything to do with his father’s dark legacy in the hopes he can start over. Willem Dafoe is brilliant as Tommy Brue as a wealthy banker who learned about what his father did for Karpov’s father as he tries to do whatever he can to put the money Karpov is supposed to inherit for good. Robin Wright is amazing as Martha Sullivan as an American securities agent who is trying to understand what Bachmann is doing as she is willing to help him despite her own motives as it relates to what her country wants. Rachel McAdams is remarkable as Annabel Richter as an immigration lawyer who is trying to help Karpov gain asylum as well as deal with the severity of her situation as she is reluctant to trust Bachmann only to see what he’s really trying to do. Finally, there’s Philip Seymour Hoffman in a phenomenal performance as Gunther Bachmann as a securities agent official who is trying to find a way to stop any form of terrorism from happening as he learns about a political prisoner seeking asylum as he tries to do whatever he can to help as Hoffman displays a humility and weariness to his role as a man had seen a lot as this mission gives him some idea that he could bring hope to the world. A Most Wanted Man is a marvelous film from Anton Corbijn that features an incredible leading performance from Philip Seymour Hoffman in one of his final film roles. Along with its great ensemble cast, themes on security and justice, and eerie visuals, it’s a film that explores the post-9/11 world where everyone is trying to identify who is on the right side and if the people that’s supposed to protect are in the right side. In the end, A Most Wanted Man is a sensational film from Anton Corbijn. I didn't have very high expectations for this, but I thought it was surprisingly layered and it worked for me though I usually find the genre tired. @assholeswatchingmovies.com-It is a solid film that managed to work in a lot of ways as it was quite surprising for me.